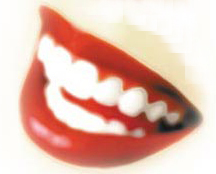 The latest LA obsession seems to be for white, whiter, WHITEST TEETH. I like the great new disposable OralB vibrating toothbrush that comes w/ a built in battery. It’s $5.95 & lasts a month. My teeth have never been very white, but I accept it. After seeing bright, natural looking smiles popping up all over town I sampled bleaching products that are readily available at the drugstore. The results– not much difference. I really don’t like the fake look of some super-white (sometimes ultra blue-white) choppers they get with veneers.